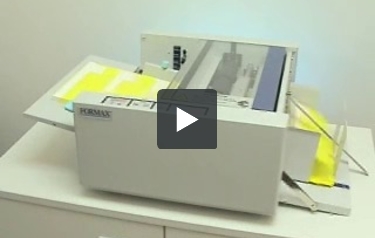 The FD 4170 Cut Sheet Burster is the ideal finishing solution when multiple forms are printed on one page. Direct from a laser printer to the FD 4170, pre-perforated forms are automatically burst at the perforation and stacked sequentially at speeds of up to 140 sheets per minute. Pre-programmed cut settings and a new LCD counter make bursting projects easier than ever. No more cut sheet bursting by hand! Paper sizes up to 11" x 17"
Min./Max. Burst Length: 2.5" - 9.9"